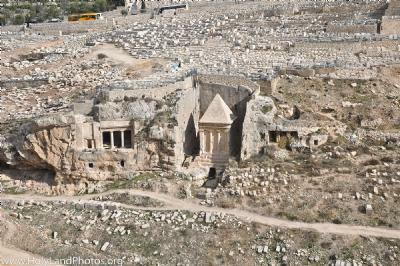 This section features a selection of the magnificent Second Temple period tombs that are located in Kidron Valley. They are on the eastern side of the valley and are carved into the hard limestone. The major tombs, from north to south, are called: the Tomb of Absalom, the Tomb of the Sons of Hezir, and the Tomb of Zechariah. These tombs illustrate well the various influences on Judea and Jerusalem during the Second Temple period, especially just before the days of Jesus for they exhibit Greek, Egyptian, and Syrian influences! See also Garden of Gethsemane.